These felt fused wheels are great protection for hard surface floors. The versitile plate attachment will allow you to screw it into the bottom of many wood surfaces. These felt fused wheels are great protection for hard surface floors. Made for going into the bottom of wood furniture. These felt fused wheels are great protection for hard surface floors. 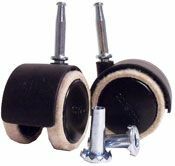 The stems on these casters are threaded to replace standard threaded wheels. 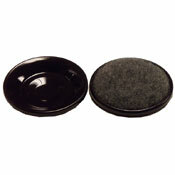 Change out your standard office chair wheels for these felt fused wheels to protect your floor. 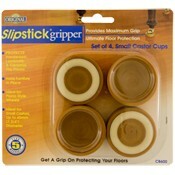 Protect your investment with these classic carpet base floor cups.